Paris (France), Campos (Brazil), Porto Alegre (Brazil), Tokyo (Japan) July 1st, 2011 - 12:00 UTC - SlapOS, Open Source Cloud Operating System, has reached a major milestone with its succesful implementation in leading international organizations in the business of Aerospace, Banking, Transportation and Education. SlapOS automates the deployment, accounting and billing of complex, elastic, distributed enterprise applications over a wide variety of POSIX compliant operating systems such as GNU/Linux. Cédric de Saint Martin, SlapOS community leader, says: "this first success demonstrates that SlapOS can either be implemented directly over dedicated servers without virtualization or over virtualized architectures such as Amazon EC2 or VMware ESX. SlapOS is compatible with more than 20 Infrastructure as a Service (IaaS) providers. It supports more than a dozen storage backends including MySQL, MariaDB, KumoFS, Sheepdog, ZEO, memached, nbd. It is compatible with the leading software stack including LAMP, Python/WSGI, Python/Zope, Java, Perl, ProActive with planned support for Ruby on Rails and Python/Django". Thierry Brettnacher, VP Nexedi, adds: "the development and deployment of a full payment application on SlapOS based on Open Source ERP5 could be achieved in less than a month at SANEF Tolling UK. Automobile drivers in the United Kingdom who are going to France can now pay their highway toll online on a SlapOS operated infrastructure." Jean-Paul Smets, CEO of Nexedi adds: "other SlapOS successful implementations include currency issuing and banking operations in a Central Bank, accounting and CRM of a highway company, quality assurance for software development, order management and integration of a satellite mission, open source web office in higher education". Cédric de Saint Martin, SlapOS community leader, comments: "thanks to automated replication of transactional data and automated configuration, SlapOS can be configured to rebuild complete IT infrastructure in a matter of minutes even in case of major disaster such as fire in the data center. This shows the key strength of SlapOS: resilience through automated disaster recovery." "We are delighted with these commercial successes" said OW2 CEO Cedric Thomas, "they represent a new milestone in OW2's code base positioning as the reference for open source cloud computing" he adds. Sébastien Robin, Quality Assurance Manager of the ERP5 project, says: "thanks to SlapOS, the 5000 unit and functional tests of ERP5 can now be executed in parallel on private or public clouds. SlapOS can test simultaneously more than 10 different development branches of ERP5, taking automatically into account the specific dependencies of each branch without having to customize the base operating system and without having to go through a time consuming process of virtual disk image generation as in legacy Cloud. SlapOS has significantly increased productivity and flexibility of quality assurance." 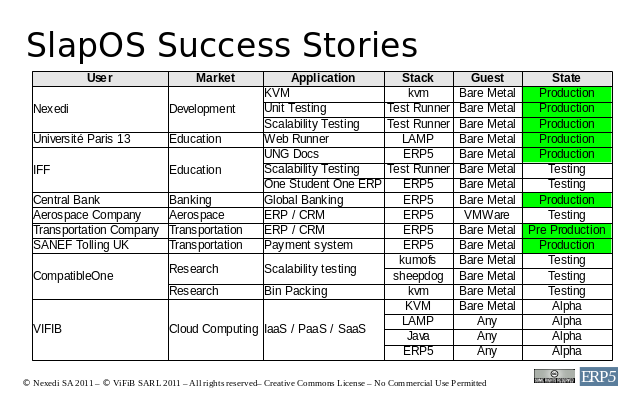 A detailed description of SlapOS success stories can be found in the presentation provided here or can be downloaded in PDF. Nexedi is the leader of the ERP5 Open Source ERP project and a provider of Open Source solutions fo mission critical applications. With offices in Europe, Asia, Africa and America, Nexedi can provide 24/7 services to the most demanding customers in the field of aerospace, banking, government and transport. With more than 100 modules, 4 IEEE research papers and 10,000 clients, ERP5 is the most advanced Open Source ERP on the market. Nexedi is member of System@tic innovation cluster, FFII, Free Cloud Alliance, OW2 Consortium and AFUL. Nexedi respects the principles of TIO Libre Initiative to protect the independence of its customers. Founded in January 2007, OW2 is an independent industry community dedicated to developing open source code infrastructure (middleware and generic applications) and to fostering a vibrant community and business ecosystem. The OW2 Consortium hosts some one hundred technology projects, including Acceleo, ASM, Bonita, eXo Platorm, Funambol, JOnAS, Lomboz, Orbeon Forms, PetALS, SpagoBI and XWiki. Visit www.ow2.org. Nexedi and ERP5 are registered trademarks of Nexedi. All other trademarks are the property of their respective owners.